On Thursday morning, I went for the first time to Tasmania – whose weather my consistent praise had long made my mother and brother wish to take me. I regrettably had only four hours sleep on Thursday morning – though it was very good sleep given the hot, humid night that resembled an equatorial climate – and despite a delay from refuelling we got to Hobart in good time and despite an inordinate delay getting a rental car we still had a lot of time to look at Hobart itself. Hobart is a hilly, sprawling city, surrounded by fairly steep green hills and a deeply indented coastline. The city itself is of only moderate size, with no more than one hundred and seventy thousand people, though the central business district where we were staying is still fairly dense. Many Hobart streets – including some very wide ones – are one-way, which severely confused Mummy when she tried to drive though them. We climbed to the top of Mount Nelson, which gives even on a wet, misty day impressive views of Hobart, and then descended the mountain to have a look around Battery Point, where we had an ice cream and sat on the wall overlooking the water. Although the weather yesterday was rainy despite the total rainfall being listed as a moderate 5.4 millimetres or 0.21 inches – 10 mm in a January day has been reported in Hobart 154 times since 1894, with 25 mm or more on 34 occasions – it was by no means unpleasant as it was merely warm and cloudy with a breeze. We had a good look at the shops near Hobart’s port, and I had a really nice chicken burger for lunch with some cheese. We then had another walk around the pier and port, during which we managed to see numerous interesting sights and old buildings. I was too tired to do much after we did a little shopping and had a ham and cheese roll for dinner, so I slept very soundly this morning. We had decided yesterday that we would go to Swansea – the place in Tassie that I have often claimed as having absolutely the best climate in Australia and one of the half-dozen best in the world – and we saw not only more Hobart sprawl and the hills, but even got to feed some tame grey kangaroos at the Tasmanian Devil sanctuary in Bonorong. Although almost all marsupials are nocturnal, we could actually see Tasmanian Devils outside, though they were mainly very old animals that were not breeding. Many of the animals at Bonorong were injured on roads – this is common with the beautiful Tawny Frogmouth – and could not survive in the wild but were still very interesting to watch. In fact, looking at the Yellow-Tailed Black Cockatoos (Calyptorhynchus funereus) attracted so much of my attention that I did not focus on the Tasmanian Devils. 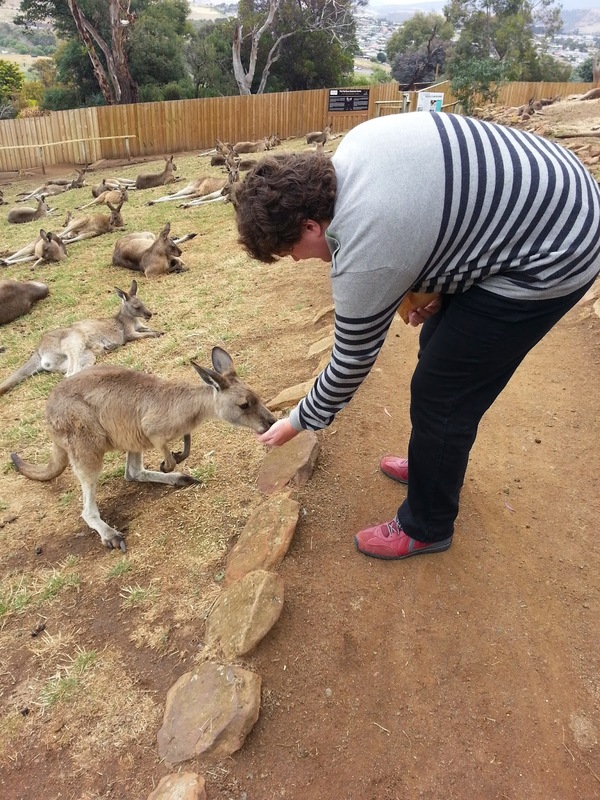 Here I am feeding a number of tame grey kangaroos at the sanctuary. 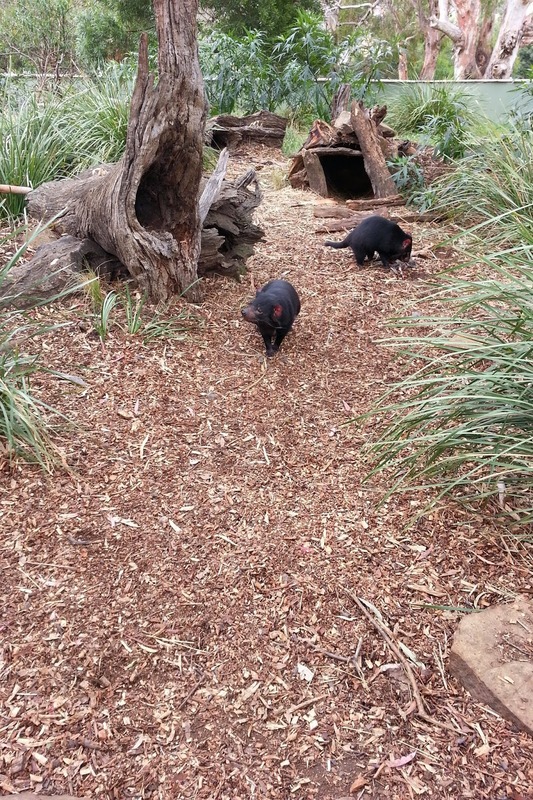 We also saw wombats, a tiger snake, and lorikeets at the sanctuary. We next went to the historic town of Richmond, which in common with so much of Europe and East Asia where agriculture can no longer compete with land-rich Australia and Africa, has become devoted to tourism. Richmond actually was a very well-maintained small town owing to its history – with the oldest bridge and oldest Catholic Church in Tasmania – and we saw some rails for the first time along with some unidentified small birds under the bridge. Lunch was a lovely steak pie, but we heard sad news about my uncle being close to death. We went again on winding coastal roads to Triabunna and Swansea, where we turned round since the ferry to Maria Island was unaffordable. The scenery changed notably from the relatively fertile ‘black earths’ to the typical ancient red texture-contrast soils (‘Acrisols’) of Australia – found elsewhere at so high a latitude only in much wetter climates on very poor parent materials in California. Most of the towns, whilst not so “touristy” as Richmond, were still influenced by tourism – a fate normal in so many places as they cannot compete (due to expensive land and labour) with Australia and Africa in their former mainstay of agriculture. At Swansea, I was very nervous on the beach about getting sand into my clothes and walked about aimlessly on the beach before briefly sitting down. I had a large cappuccino but my brother thought I was too rude asking for more chocolate, and then we returned to Hobart. After a rest as I remained very tired, I went to look for a Chinese meal for dinner, which Mummy and I ate more fully than we usually do with Chinese take-aways at home. There was the unusual feature of duck with the rice and a fried noodles, as almost our last action before going to bed still tired. So nice to see that you, Jonjo and mummy enjoyed your trip to Tassie. I thought you had been there before, as I know what you always say about its weather! I did a roadtrip too around Tassie 10yrs ago. I knew you would talk about TN and MR and the MAWC and PPC.